Pearl & silk powders make up the main part of this loose powder - also contains other nourishing powders. Excellent for oily skin types, but can be used by any skin type because the pearl & silk powders are 'self-adjusting' to the moisture needs of the skin. Can be used as a primer powder, finishing powder, or as a night treatment. How to use: I recommend applying this product with a fluffy makeup brush. Sprinkle a small amount of powder (think of sprinkling cinnamon on a latte) on a plate or small bowl, smoosh the brush into the powder, tap off the excess, then dust lightly on the face. Repeat as needed. For best mattifying results, I recommend applying right before your makeup. It can also be used to dust lightly over foundation – like a finishing powder. 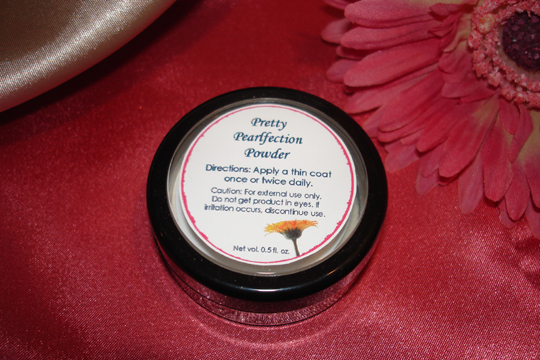 Or if you have a loose powder foundation or finishing powder, you can mix some of the Pearlfection Powder with that before applying. You can also use it to ‘touch up’ later in the day – just use a light hand & a fluffy brush. Ingredients: oryza sativa (rice) powder, silk powder, pearl powder, silymarin powder, hydrolyzed oat protein, titanium dioxide, & zinc oxide.